This film, made by an Italian crew who started out as liberals, was meant to document the decolonization process in Africa in the early 1960s. The film crew however, soon discovered the reality of Africa up close, and, after losing crew members to the savagery of that continent, the film ended up being an indictment of Africa and Africans. "What the camera sees it films pitilessly, without sympathy, without taking sides," it begins. "This film only says farewell to the old Africa and gives the world a picture of its agony." Here was a world ruled by rebels and refugees, plunderers and poachers, mercenaries and murderers, a land suddenly aflame with brutality, racism and unspeakable slaughter. At the risk of their own lives, the filmmakers' cameras captured it all. The result is a daring and disturbing work that ranks among the greatest achievements in documentary cinema, an experience that remains as shocking -- and shockingly relevant -- as it was 40 years ago. Despite thunderous acclaim, worldwide controversy drove this masterpiece from American theaters shortly after its premiere. 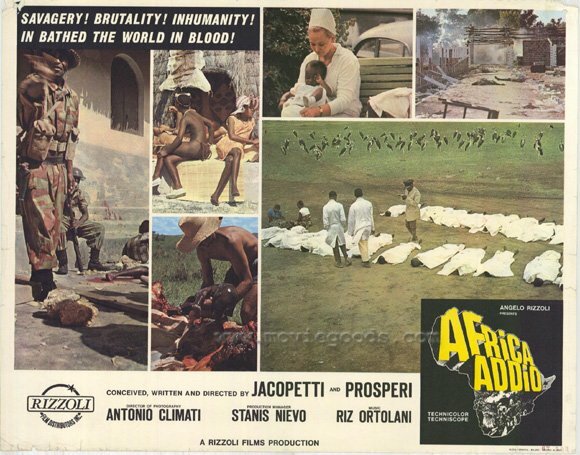 Some years later, U.S. distributors would remove over 45 minutes of political context and re-release it as AFRICA BLOOD AND GUTS, a move that the film crew both disowned and despised.